Custom vs Semi-Custom Cabinets | MTKC - MT Kitchen Cabinets, Inc. San Mateo, California. One of the questions we get asked the most is, “What is the difference between custom and semi-custom cabinets?” Let’s take a look at the benefits of the two offerings. “Custom made” means something was purposely made to certain specifications for a particular person or situation. While both custom and semi-custom cabinets are built to order, the number one benefit lies in the fact that custom cabinets mean choices; they have the flexibility to adapt to unique situations. For example, most custom cabinet brands can manufacture many more sizes than semi-custom lines can; so custom cabinets are better able to accommodate different design layouts and different appliance sizes. As to the degree of customization—each brand varies from another because of the nature of their machinery and craftsmanship. Other than sizes, custom cabinetry is likely to outperform semi-custom cabinetry in areas such as finishes and door styles. Brands like Plato Woodwork will do custom color matching to a piece of your furniture, or even to the color of your favorite scarf. But the more important aspect of custom cabinets is their ease of installation. Custom cabinet brands sometimes allow for joining cabinets into one larger piece before finishing and shipping. For instance, instead of installing two 30-inch-wide cabinets, the customer can choose to have a single 60-inch-wide cabinet. Not only is one larger cabinet easier to install than two small ones, pre-joining also eliminates the seam that would have otherwise existed in between the two cabinets due to the joining on site. Furthermore, the ability to do all the gluing and nailing to combine different pieces at the factory before finish allows for fewer touchups on site, and fewer seams in the end product all together. This is especially true of moldings and trim pieces attached to the cabinetry before finishing. It is unlikely that a typical cabinet installer can install the cabinets and hide the touch-up. And if the installer can hide it well, what price are you paying for his time? When applicable, it’s simply more effective and economical to have it done at the factory. 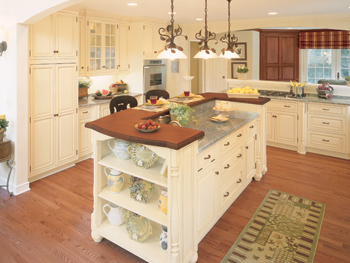 One common misconception is that all custom cabinets are of higher quality than semi-custom cabinets. Quality comes from dedication to craftsmanship and details, and from the finest material and consistency of state-of-the-art manufacturing plants. In other words, quality lies in the cabinet brand. Don’t be fooled by cheap custom cabinets! If you do not have a space that requires custom sizes, and can find the right offerings within the semi-custom products, you can find many high quality semi-custom products that suit your needs at a more affordable price. KraftMaid, for instance, is known for its Harmony storage solutions as well as the value and savings of its products. So don’t dismiss a brand at first glance just because it is not custom. Semi-custom brands offer wonderful looking kitchens, too. The above content was published in Home Digest Magazine in March 2007. For reference to the actual copy, please download this pdf file. For other related content on how to get started on your remodel, please see How to Measure and Sketch a Floor Plan video, Typical Work Flow Procedure, and Typical Construction Schedules.